The Blogger's Guide to Effective Writing was fully updated in 2018. It comes with post templates and detailed video reviews of real-life blog posts. To help you go even further with writing great blog posts, I've created some extras to go along with The Blogger's Guide to Effective Writing. You get my very own templates to help you produce great posts, every time: these are a great way to get started quickly, if you're in a hurry to produce content. They cover four key types of post: how-to posts, list posts, link posts and review posts. I've used these time and time again, so I know they work well! The Templates pack also includes examples of how you can take another person's blog post, break it down, and use its structure for a post on your own blog (even if you write about a completely different topic). In the bonus videos, I go through several different bloggers' posts, showing you what they're doing well and what they might improve on. I hesitated to buy The Blogger's Guide to Effective Writing, because I've already been successfully blogging for a couple of years, and I've been reading all the how-to-blog blogs. I wasn't confident it would it tell me anything I didn't already know. But hey, six month guarantee, I might as well try it out. I must say, I was impressed. I did know a lot of the material in the e-book, but I sure wish I had read this two years ago -- it would have saved me so much time learning the hard (and slow) way! I picked up plenty of new things, too. For example, the Guide gave me some ideas for blog posts that will be fresh and interesting but still in my voice and style. And there's a list on page 74 that I'm going to use every single time I edit something from now on. I heartily recommend this e-book, especially to new, budding, and growing bloggers! And you'll get access to exclusive critique videos. I've critiqued a number of blog posts from real-life bloggers, all at different stages of their blogging journey and with different levels of mastery of writing. In the Guide, you'll get the password to access these videos: in them, I show you exactly what the bloggers are doing well and what they might want to think about tweaking and changing. There's a discount code included (on page 5, just after the table of contents) for the The Blogger's Guide to Freelancing, another ebook in this series. If you'd love to make great money and get your name out there on big blogs, you can get started straight away. I want you to have the time to try this out: to see your blog get more readers, to see your writing style develop, and to get closer to all your blogging goals. So rather than the standard 30 day guarantee, I'm offering a six month guarantee. If the ebook doesn't work out for you, I'll be glad to send you a full refund. Just drop me an email (ali@aliventures.com) before the six months is up. 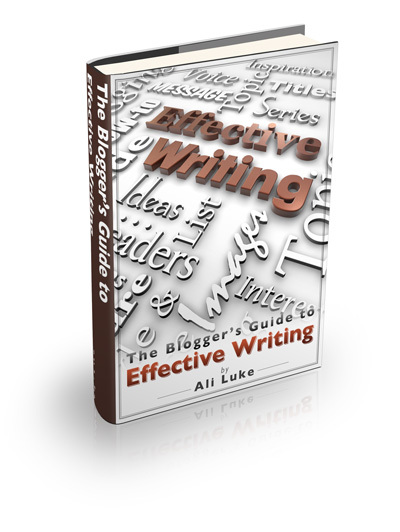 I’ve just finished Ali [Luke]’s The Blogger's Guide to Effective Writing and I can’t wait to jump right back in! When I first started blogging, my goal was to do it right! I wanted to engage readers, provide useful content, and hopefully make some money! I knew I had a lot to learn so I pored over post after post on all of the “blogging blogs”.